Duke has beat Arizona four times and the Wildcats beat the Blue Devils three times. Is that right? I don’t follow basketball very much, but I do like watching games. And the same scientific principles apply to sports as to ecology. Since each game is a separate event when you think like a statistician, the past record does not determine who will win tonight’s game. For the communities of similar plants that live around Tucson, the weather each year is also a separate event. The amount of rain last year does not determine this year’s rain. But if the factors that control the outcome are similar to past years, we can figure out the probability of that outcome. For example, if we measure wind speeds and directions over the oceans, we can estimate the probability that this year will be wetter than usual in Arizona. That would benefit many of the wildflower species. The wind patterns can be related to the amount of rainfall, and meteorlogists look for the factors that cause the relationship, like the physics of the wind patterns’ directions. Likewise, if Arizona had never beat Duke, we might wonder if Arizona recruited less talented players, or practiced less, or had an ineffective coach. Fortunately, that’s not the case! We have a real shot at winning tonight, based on the factors that predict outcomes. Of course, that “historical range of variation,” or the set of past experiences, could always be changing in some specific way. For example, a team might get better over thirty years as a coach gains experience, and his winning record attracts better players. In ecology, many habitats have become more and more “fragmented,” or broken up by roads and houses over the last thirty years. On a longer time scale, as a school gets more established and wealthy over a century or two, its sports might also improve. Ecologically, as greenhouse gasses warm the earth, the physics of those wind currents might change, and we will have a harder time predicting our rainfall in Arizona. So here’s to hoping Arizona wins tonight! There are whole fields of science that deal with why I’m hoping that (neuroscience and psychology), which I won’t get into. Spring break means islands, but human visitors to islands have brought new animals that have caused widespread extinctions of endemic island birds. 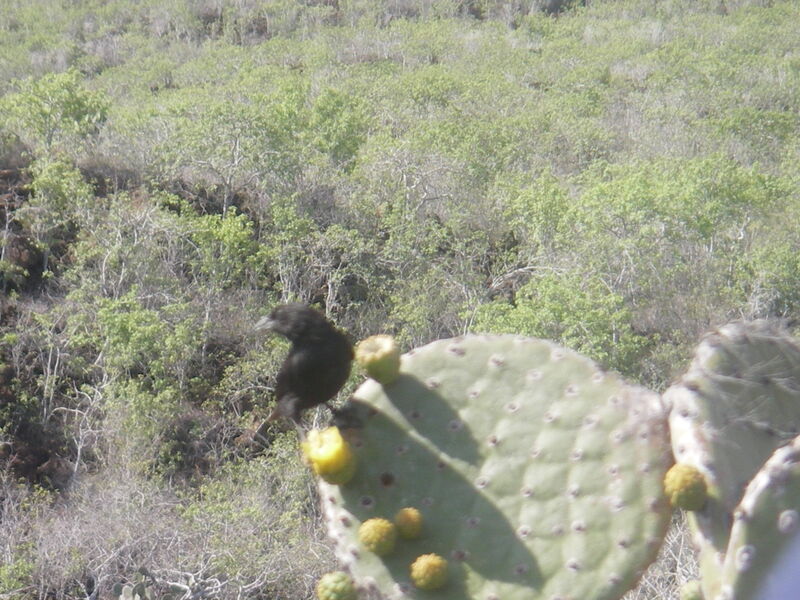 This finch in the Galapagos, however, seems to be doing just fine. Since spring break is just finishing at some schools and just about to start at others, I have been thinking about islands. Lots of people will go on cruises, or to spend the week on an island, scuba diving or just surfing or lounging. But all those visitors have had some serious effects on biodiversity on those islands. Since the 1600s, when humans first caused the extinction of the island bird called the dodo by bringing dogs, pigs, rats, and other animals that found eggs lying on the ground an easy breakfast, island birds have gone extinct in great numbers. Guam’s native birds were wiped out by the introduction of the brown tree snake, and avian malaria has done a number on unique Hawaiian birds. Plants, on the other hand, have not gone extinct in large numbers on islands due to introduced species. That is according to a 2008 study by Dov Sax and Steven Gaines. There are certainly examples where domestic goats have run wild and eaten off virtually all of the remaining slow-growing and unique silverswords in Hawaii. Rob Robichaux, a faculty member at University of Arizona, along with a number of other scientists and dedicated volunteers and professionals, are trying to save those silverswords. So why do introduced plants tend to naturalize without causing extinction of native plants? Maybe they are using resources in a different way and will continue to coexist. They certainly can change the ecosystem’s look, structure, and functioning (how much biomass grows, how humid the climate is, etc.). So maybe they are causing extinctions, just more slowly than a disease epidemic. The paper by Sax and Gaines asks some of those questions, but scientists do not know the answers yet.